On a fresh April evening in Barcelona, an elegantly dressed lady pulls the handle of a brass ship’s telegraph, achampagne bottle swings through the air and glass smashes on steel. With a flurry of confetti filling the sky, Sirena – that’s Mermaid in Spanish – is christened. It is a dignified, traditional and – by modern standards – low-key occasion. 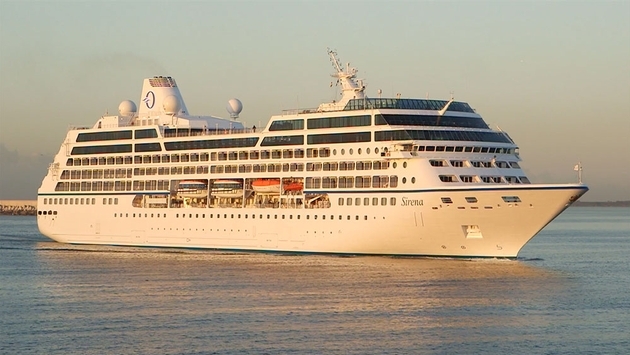 And that’s just right, because Sirena is the sixth addition to the fleet of Oceania Cruises, and understated elegance is their watchword. Built in the classic style for Renaissance some 17 years ago, this 684-passenger vessel was instantly popular with devotees of smallship cruising. Now, following her acquisition by Oceania and a $50 million refit, Sirena has gained contemporary verve without losing any of her nostalgic appeal. To ensure that his vision becomes Oceania’s reality, Del Rio is a hands-on boss, specifying the finest materials for the refit and personally choosing the artworks on board. He also keeps a close eye on the galley, to see that Oceania’s cuisine is second to none. 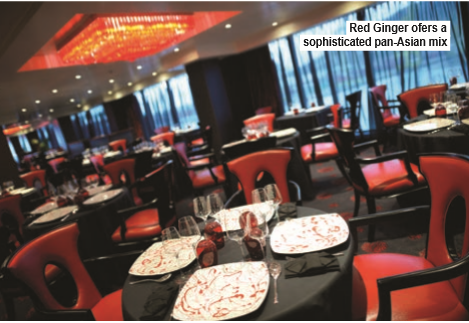 Oceania Cruises’ passion for cuisine was reflected in the choice of Godmother for Sirena. Claudine Pépin – the lady who launched the champagne bottle – is not only a respected chef in her own right; she is the daughter of Jacques Pépin, personal chef to three French heads of state, including Charles de Gaulle. 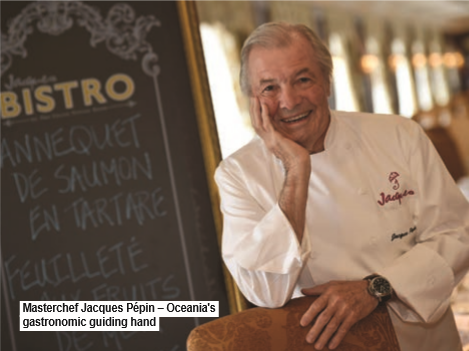 Pépin senior has served as Oceania Cruises’ Executive Culinary Director since its founding, and his influence is evident in Sirena’s two new speciality restaurants, high up on Deck 10. Tuscan Steak, lined with glossy wood panelling, offers an innovative menu with signature dishes such as porterhouse bistecca alla Fiorentina, while in the adjacent Red Ginger, with its decor of vibrant red chandeliers, dark ebony and striking modern art, the Pan-Asian cuisine includes miso-glazed sea bass and lobster pad thai. And then there is the Grand Dining Room, with all the panache and refinement you’d expect of a world-class restaurant. 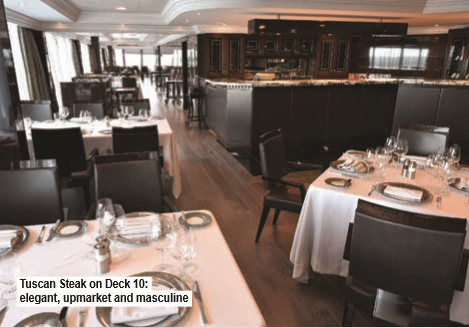 Our first call on this inaugural cruise also had a distinctly foodie flavour. Stepping ashore at Marseille I took the opportunity to sample a Culinary Arts Tour, an excursion offered on board Oceania’s Marina and Riviera. After a short drive we arrived at the impossibly pretty town of Aix-en-Provence. Set against the rich, mellow coloursof the historic centre was an umbrella-covered market where flower-stands and colourful vegetable stalls bustled with locals. I particularly liked the aromatic cart selling roundels of ripe goat’s cheese, arranged by size and looking like a tiny drum kit. Most of the cheeses were plain, chalky white; others were adorned with lavender petals or spiky herbs or red peppercorns. After this taste of Provençal life we meandered further west through the unspoiled countryside of Luberon to the Auberge La Fenière. Here chef-p atron Reine Summut showed us how to prepare barigoule de petits artichauts, before we sat down to a delicious lunch under a cloudless cobalt-blue sky that seemed to go on for ever. All too soon it was time to return to Sirena, docked beside Marseille’s colossal Sainte Marie Majeure Cathedral with its striped façade of white and green. Cruising on towards the French Riviera, I took the chance to see how the millions of dollars recently invested in Sirena have been spent. Very well, is the short answer. The pool area has been remodelled in upscale resort style with teak flooring and deep-pile mattresses for the incredibly comfortable sun-beds. Up on Deck 10, Horizons is the venue for afternoon tea, cocktails or late-night dancing, and the combination of floor-to-ceiling windows and decor in chocolate and blue gives it elegant aplomb. Martini’s Bar is decked out with wing-back chairs, a fireplace surrounded by nautical prints and a grand piano, which sets the tone at cocktail hour. When it comes to the cabins, the Owners,’ Vista and Penthouse suites are now the last word in refined glamour. 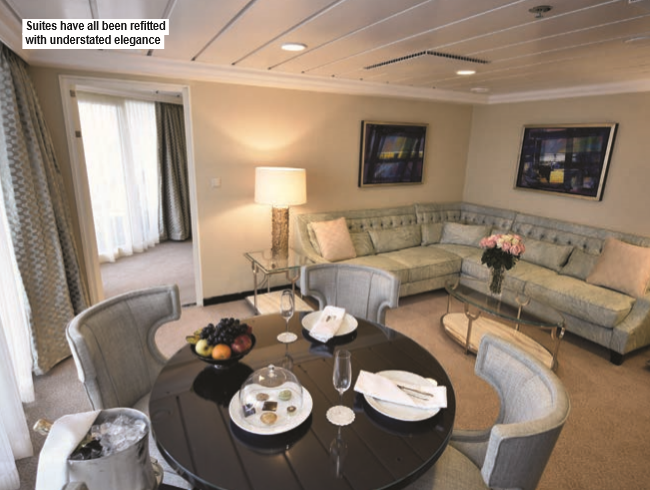 Regular staterooms get new soft furnishings in the signature colour scheme of indigo and gold, as well as top-of-the-range bedding (though disappointingly, the small bathrooms still have clingy shower curtains). Possibly the most welcome enhancement ship-wide are the new Ultra Tranquility Beds with 3,000 coil springs and air suspension. You don’t know what a good night’s sleep is until you’ve tried one of these – though if you still need R ’n’ R there’s always the CanyonRanch Spa Club. A feature of all Oceania’s ships, this is without doubt the most professionally run spa at sea, with a vast array of skincare and body treatments delivered by highly trained therapists. A 50-minute “tension zone” massage set me up perfectly for an exploration of St Tropez. Once a quiet fishing village, St Tropez shot to fame as the setting for the 1956 film And God Created Woman, which starred a 21-year-old Brigitte Bardot and sent the censors into a fluster. This still tiny port, with its the backdrop of warm terracotta buildings, has been a must-visit for the international smart set ever since. Wandering around the harbour, a millionaire’s playground where Russian appears to be the common tongue, I couldn’t help noticing that beautiful people wear ugly things, while ugly people wear beautiful things. Nowhere was this more evident than at L’Opera, an achingly fashionable bistro adorned by white geraniums. I took one look at the prices and headed for a humble bakery for a tarte Tropezienne – the deliciously cream-laden local speciality – which I enjoyed in the subtler surroundings of Sirena. Oceania already leads the upper-premium market with its vessels Regatta, Insignia and Nautica, and this new addition raises the bar. So what further treats does boss Del Rio have in store? As we talked one evening he gave me an inkling: it’s the “forbidden fruit of cruising”, otherwise known as Cuba. Del Rio, you see, was born there. He left the island aged six but has been dreaming of taking a ship back ever since – and with the market opening up since the thaw in US-Cuban relations, he reckons he’ll get permission to operate an R-class ship by the end of the year. His dream itinerary is a 10-day round-trip sailing from Miami, taking in Havana, Cienfuegos, Santiago de Cuba and Holguin. And watch this space, because Mr Del Rio has a way of making his dreams come true. A 10-night Mediterranean Spotlight cruise aboard Sirena from Rome to Barcelona, departing 7 July 2017, costs from £2,419 including flights and free unlimited internet, plus one of the following: $400 shipboard credit, house beverage package, or four free shore excursions. Sirena will operate a winter-long series of voyages from Los Angeles to French Polynesia, and then sail to New Zealand and Australia before heading back to the Mediterranean in June 2017. See oceaniacruises.com or call 0345 505 1920. Tips: $16 per person per day in all staterooms; $23 per person per day in penthouse suites and above. Laundry: dress $11.50, shirt $5.95 Spa: Tension Zone massage $140. Excursions: Highlights of Monaco $129 for four hours; Rome $269 for ten hours. Culinary Arts Tour in Provence, escorted by Oceania Cruises’ chef-instructor, $239 including lunch (excursion limited to 24 guests).